Dr. Deborah Klotz, or Dr. Deb, as her patients call her, started years ago, in Washington DC, with a Journalism degree from The George Washington University. 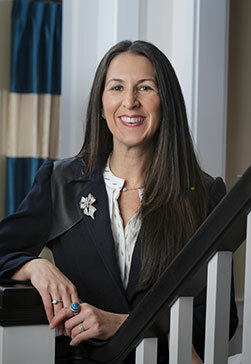 Her path to Bethesda Sedation Dentistry began after college when she proceeded to The University of Maryland to earn her DDS degree with honors. Following dental school, she went into private practice in the Baltimore region, but knew she always wanted to practice closer to the Washington D.C. area. As she searched for the perfect practice opportunity, she continued to improve herself as a clinician. Over the years, she has completed training with Implant Seminars and The Misch Institute, ultimately earning a fellowship with the International Congress of Oral Implantology. Additional studies with The Dawson Academy, have given her significant knowledge and experience in the treatment of complex restorative dental needs. As a practicing board certified sedation dentist, she is constantly striving to offer the safest and most advanced techniques in Sedation Dentistry. She has also studied with world renowned clinicians including Drs. Carl Misch, John Suzuki, Clifford Ruddell and Michael Pikos, learning the most successful and current root canal, surgical and dental implant techniques. Dr. Klotz’s passion for dentistry has afforded her many wonderful opportunities, including being able to offer her services to those who are less fortunate through organizations like Give Back A Smile—a program created to help abused women. In addition, she is a founding member of Mommy Dentists in Business, which is a nationwide group of entrepreneurial moms devoted to helping fellow “mombosses” succeed in juggling their dental practices and family responsibilities. When she is not at the office, Dr. Klotz can often be found sailing out on the Chesapeake Bay, or strolling the city with her dog Dharma. We doubt she’ll let you out of the office without seeing pictures of her sons Carter and Bennett who are a joy and the spitting image of Dr. Rob! Together with her husband Dr. Robert Schlossberg, they look forward to welcoming you as part of their dental family. Dr. Klotz was absolutely amazing–from the moment they take you into their care, you understand that this is different kind of dental experience. It is clear they understand the underpinnings of stress associated with visiting the dentist and they go out of their way to make the patient feel as comfortable and at ease with the visit. I have seen the future of dentistry and it is Bethesda Sedation Dentistry! Bethesda Sedation Dentistry offers sedation, cosmetic, restorative, endodontic, and implant dentistry services for patients in Bethesda and the greater Washington, D.C. area. We look forward to meeting you, and invite you to make your appointment today!